2017-09-01 2017-09-22 Tender for house keeping services at NIT Patna. 2017-07-03 2017-07-07 Corrigendum for Supply of Equipments for Optical Fiber Communication and Photonics Lab. for ECE at NIT Patna. 2017-06-28 2017-07-18 Tender Notice For Procurement of Gym Equipment, NIT Patna. 2017-05-25 2017-07-04 Revised Tender for Lab Furniture under Turn-Key basis for Chemistry Dept., NIT Patna after Pre-Bid. 2017-05-19 2017-06-27 Tender for equipment for Geotechnical Lab. 2017-05-15 2017-07-04 Addendum to Tender for Lab. Furniture for Chemistry Dept. 2017-03-21 2017-04-11 Procurement of Equipments for DST Project Chemistry at NIT Patna. 2017-03-02 2017-04-04 Procurement of equipments for Inorganic Chemistry Lab., NIT Patna. 2017-01-09 2017-01-25 NATIONAL COMPETITIVE BIDDING FOR THE SUPPLY OF SMART CLASS ROOM. 2016-10-05 2016-11-08 Tender for auction of bricks, levelling and clearing of the surface area of Carpentry and foundry workshop at NIT Patna. 2016-09-27 2016-11-15 Tender for double Distilled Water setup for B.Tech. Lab. Chemistry Dept. 2016-09-22 2016-11-02 Procurement of RAM for VLSI Lab for ECE Department, NIT Patna. 2016-09-23 2016-11-02 Tender for Supply of PCB Fabrication Machine for SERB Project at ECE Dept. 2016-09-22 2016-11-02 Procurement of PCB machine for ECE Department, NIT Patna. 2016-09-07 2016-09-30 Procurement of instruments for DST-SERB research Project of Physics, NIT Patna. 2016-09-07 2016-10-04 Procurement of Lab. Furniture for Chemistry Dept., NIT Patna. 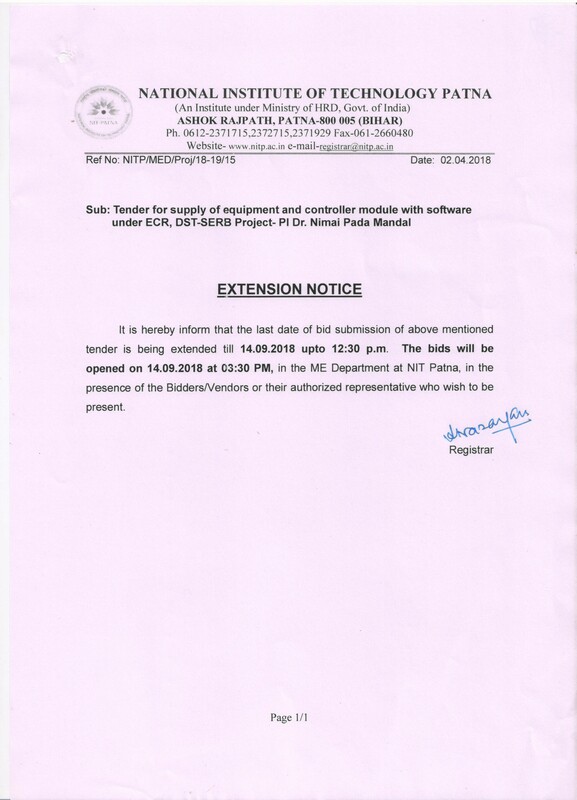 2016-06-29 2016-07-11 Extension of date for Supply of Solar Equipment for Surya Mitra Training Program at NIT Patna. 2016-05-11 2016-05-30 Tender for supply of Solar Equipment for SuryaMitra Training program at NIT Patna. 2016-02-01 2016-03-04 Procurement of equipments for Environmental Engg. Lab. of Civil Engg. Dept., NIT Patna. 2016-02-01 2016-03-04 Procurement of Software for Civil Engg. Dept., NIT Patna. 2016-02-01 2016-03-04 Procurement of equipments for Structural Lab. of Civil Engg. Dept., NIT Patna. 2016-02-01 2016-03-04 Procurement of equipments for Geotechnical Lab. of Civil Engg Dept NIT Patna. 2016-02-01 2016-03-04 Procurement of equipments for Water Resources Lab. of Civil Engg. Dept., NIT Patna. 2016-02-01 2016-02-29 Procurement of Digital Forensics Laboratory at CSE Deptt., NIT Patna. 2016-01-27 2016-02-16 Procurement of equipments for DST Project of Chemistry Dept., NIT Patna. 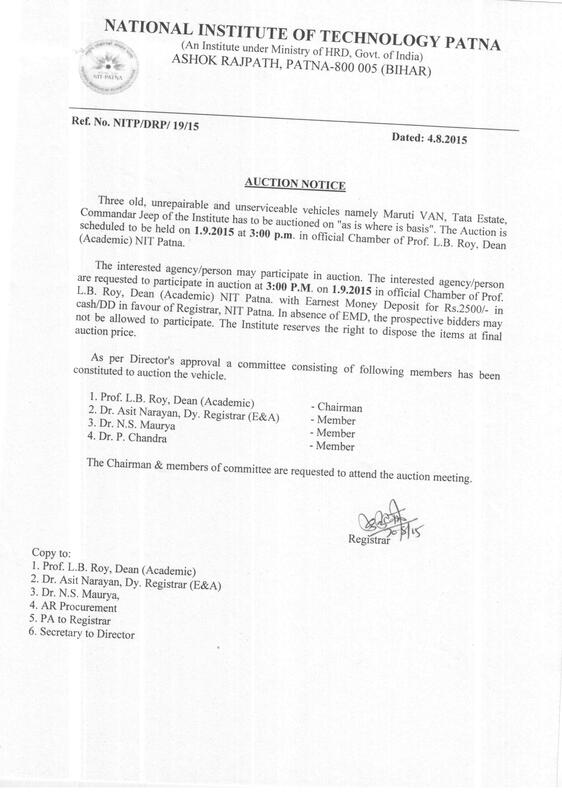 2016-01-11 2016-01-25 Tender for disposal of Scrap materials at NIT Patna. 2015-08-28 2015-09-02 Auction of old unrepairable computer peripherals, furnitures etc. 2015-08-28 2015-09-02 Auction of old photocopier, chair, fan etc. 2015-07-28 2015-07-27 Procurement of Equipments for Research lab. of Chemistry Department, NIT Patna. 2015-05-30 2015-07-16 Procurement of Equipments for Research lab. of Chemistry Department, NIT Patna. 2015-05-30 2015-07-01 Procurement of Microwave Reactor, Chillar for Rotary Evaporator & High Vacuum pump for Chemistry Lab., NIT Patna. 2015-05-30 2015-07-01 Procurement of equipments, reagents and glassware for B.Tech lab. of Chemistry Dept., NIT Patna. 2014-12-16 2015-01-28 Supply and Installation of equipments & Software for Language Lab.